Frozen food means foods which are maintained at a temperature at which all moisture therein is in a solid state. Increasing number of working women, change in consumer purchasing patterns, busy lifestyles, availability of wide range of frozen food products in different categories I are the factors leading to greater indulgence of frozen food. It is also considered as the next generation of convenient ready foods. The basic raw materials used in the production of frozen food include chicken, fish, pizza, beans and others. Raw material distributors and suppliers such as Cargill Inc., Ingredion Inc. and others supply various raw materials and ingredients according to the precise need to the manufacturers of frozen food according to the standard they have establish during their product testing. The global frozen food market in terms of revenue was valued at USD 224.74 billion in 2012. The product segment covers various frozen food categories such as frozen ready meals, frozen fish/seafood, frozen potatoes, frozen fruits and vegetables and frozen soup. The frozen ready meal segment includes wide range of products such as frozen pizza, desserts, entrees and snacks etc. The frozen ready meals market is estimated to grow at a CAGR of 3.9% from 2013 to 2019. Frozen potatoes occupied a very small share in the market and are expected to increase their market share in future due to expanding range of applications for frozen potatoes. Frozen vegetables and fruits are considered the product for the next generation due to advancement in freezing technologies which provide products with an extended shelf life; therefore it is expected to increase its market share by 2019. In 2012, Europe was the market leader in the frozen food market and accounted for more than 35% of the share. The Europe frozen food market in terms of revenue is expected to grow at a CAGR of 3.8% from 2013 to 2019. In Europe, Germany is the biggest consumer of frozen food and accounted for more than 15% share in the market. In the future, Asia Pacific is expected to be the most promising market occupying 24.8% of the market with economies such as India and China being the chief contributors. But, RoW is expected to witness the highest growth rate due to emergence of Brazil and Argentina as the new market for frozen food. While, the North America market is expected to grow at moderate growth rate in the future. The global market for frozen food is highly fragmented with the top five players accounting for around 17% share in the total market. Nestle, ConAgra, H.J. Heinz are some of the leading industry participants in this market. Over the next five years the market concentration is expected to increase as the major players continue to grow through advanced technology, acquisition and different strategies to increase their market share and mainly due to their ability to bypass the wholesalers and sell directly to the retailers. In addition 12.5% of the market was occupied by private label which also acts as a major challenge for the international players to enter and establish themselves in the regional markets. Other which also includes companies such as The Schwan Food Company, McCains and also many local and unorganized brands occupied a combined share of more than 65% in the global frozen food market in 2012. The global frozen foods market is in a state of moderate, yet constant expansion. Frozen foods are high on the convenience quotient, and hence the adoption of frozen foods will continue to be observed in areas where urbanization is gathering pace. The market research report on the global frozen food market takes a granular look at the many influencing factors that are steering this growth. The report is a result of qualitative and quantitative research techniques that aim to drill down to the exact factors that are – driving growth, restraining growth, and creating new opportunities for growth. Frozen foods, as the name suggests, are stored at sub-zero temperatures to ensure that their moisture content stays in a solidified state. This helps preserve foods several times longer than fresh food. The following are causative factors for the growth of the frozen foods market: An increase in the number of working women globally, hectic lifestyles that necessitate reliance on convenience foods, new product launches and intelligent product positioning by frozen foods producers. Common examples of frozen foods are: meat (chicken, beef, pork, turkey, and fish), vegetables and beans, soups, meals, pizza, and others. The frozen foods market depends on raw material distributors such as Cargill Inc. to supply the right quality and variety of foods that can be frozen for retail buyers. 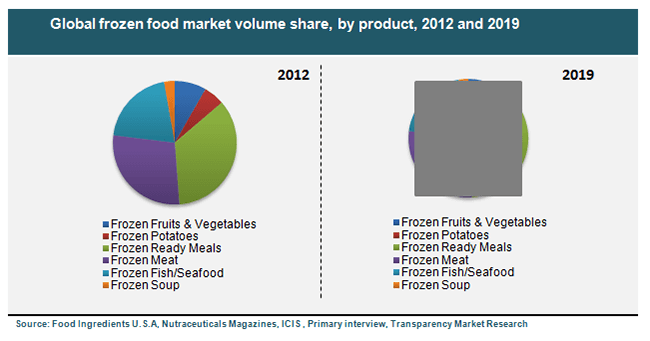 According to the estimates of TMR’s research, the global frozen food market could top US$293.75 billion by 2019. In 2012, the global frozen food market was estimated at US$224.74 billion. This market is forecast to show a moderate CAGR of 3.9% from 2013 through 2019. 35% of the global market. Key product categories within the frozen foods market are: Fruits and vegetables, potatoes, meat, ready meals, fish/seafood and soup. The frozen ready meals market holds about 35% of the total market share. The fastest growth will be witnessed in the frozen potatoes segment through the forecast period of this report. Impeccable hygiene and temperature controls are integral to the operations of players in the global frozen foods market. However, these are also the key challenges because most leading players are almost entirely dependent on third party distributors to reach retail consumers. The top five companies in the frozen food market take away about 17% of market revenues. These top names include: Nestle, H.J. Heinz and ConAgra. In the coming years, market concentration will likely rise as leading players deploy advanced technology, M&A strategies, and reduce dependence on wholesalers to directly reach retailers. About 12.5% of the total market share was held by private labels dominant in regional markets. Some other prominent names in the frozen food market are McCains and The Schwan Food Company. Besides these names, the market features a number of unorganized brands that boasted of a 65% market share as of 2012.